Tablet as a substitute for a chart plotter? When writing the previous blog post on waterproof case for iPad, I started wandering off from the topic and decided to make a separate blog post on the subject: "Could a tablet be a substitute for the chart plotter?" We tested this during our summer cruise to Sweden this season. In order to save some money, we did not buy electronic nautical charts for our Garmin plotter for the High coast, since we had both paper and iPad Navionics charts for the area. Furthermore, I thought that it is also a good idea to rehearse visual navigation skills without checking the position from the chart plotter all the time - it is easy to become lazy and too dependent on the plotter. After all, for low visibility situations we would have that iPad as a backup. 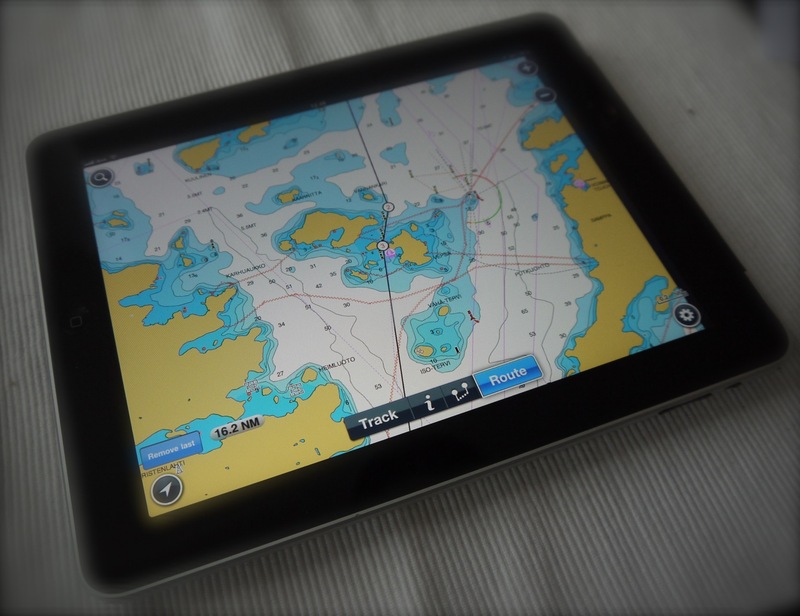 First of all, the nautical charts for iPad are very inexpensive compared to the charts for the plotter. For example Navionics Marine Europe HD application costs about 50 € for iPad and it covers basically the whole Europe excluding sea areas of Denmark and UK. Garmin's bluechart G2 vision chart covering only the Gulf of Bothnia would have cost us about 260 €. However, the G2 Vision charts contain for example more information on harbours and also 3D charts (I have not yet figured out, what to do with that feature?). All in all, that means, that the prices are not fully comparable. 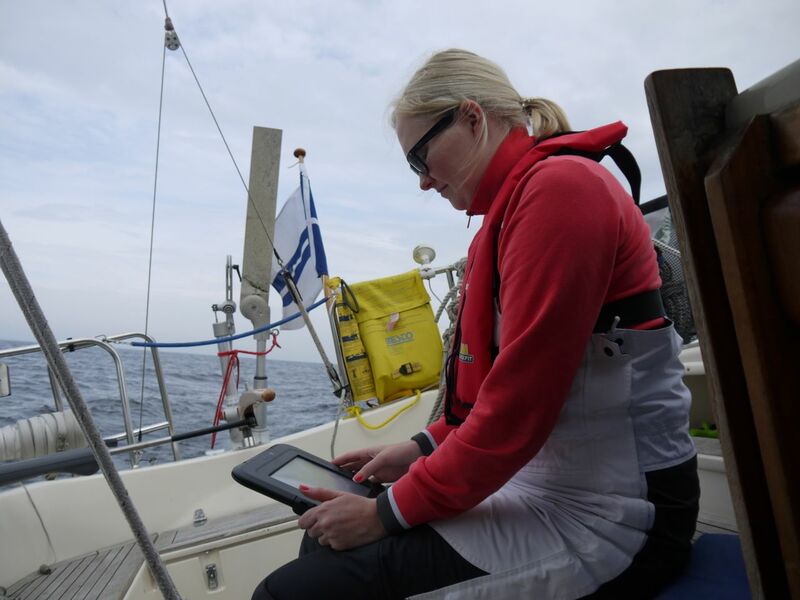 Thirdly, the iPad is portable so it can be used anywhere on the boat (or at home for example). Naturally, the chart plotter is designed for maritime use so it has some strengths compared to iPad. In general, during offshore/coastal sailing I tend to use the iPad perhaps more than the plotter, because moving through the chart and zooming are so handy with the touchpad. However, during longer legs traditional compass and GPS waypoints are the most important navigational aids, so usually the chart plotter is not needed that much. Based on my experience, the value of the chart plotter increases when conditions worsen. On a couple of occasions during this season, when the visibility was low due to rain and it was windy, I learned that iPad cannot really replace our fixed chart plotter. Especially, in rough weather with a small crew, it is easy to run out of hands when steering and adjusting the sails, so it is important that one can just quickly check from the display that everything is ok with the course. With iPad you need at least one hand to switch the device on, and if the iPad does not have a fixed mount, you have to hold it in your hand. Furthermore, iPad easily turns into a flying object onboard, when the ride gets bumpy. Therefore, iPad should have a fixed mount with a possibility to charge the battery while using so that display can be switched on all the time. There are various stands/mounts available for iPad, but I guess that charging the device is unfortunately not possible with any of the waterproof cases available. Often things go wrong when something unexpected happens. 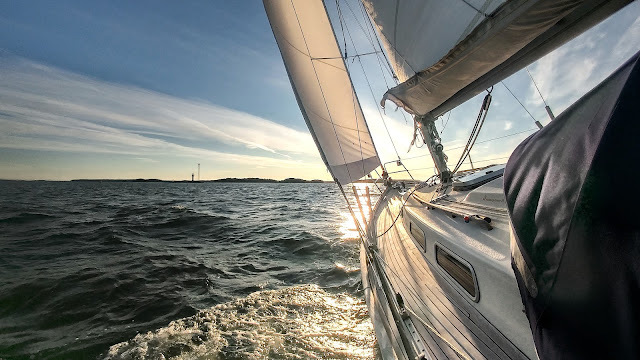 The initial event may not be anything too serious - like gennaker getting tangled around the forestay, but it is easy to become too concentrated on fixing the problem, that the navigation is overlooked. In these kind of situations it really helps, that one can just in few seconds check from the chart plotter that the boat is on a safe course. I think that this implies even more to some emergency situations like man overboard. Do not get me wrong, I think that iPad is a great tool for navigation, but it is at its best when used for route planning and as a secondary chart plotter. After this season's experiences, we will always have electronic charts downloaded for our primary chart plotter as well. What about you, do you have experiences on using a tablet for navigation? Do you think that it can replace the chart plotter? Suggestions on how to improve the usability of the tablet on boat? We have iPhone, iPad and Lowrance Elite-5 on board. Both iPhone and iPad are used only for backup. Mainly for the same reasons you have listed above. With higher wind and sailing alone I do trust more in a device which has been designed to marine conditions. However I had problems with the powercord of the chartplotter. So latest trips I used visual navigation and iPhone only when needed. I found this actually very relaxing. With chartplotter I must put myself to the paper map once in a while. Now I was on the paper map all the time. I did not have to rely on a electronical device as much as before and I was improving my navigation skills. I think this is how I will continue. Hi Marko, I agree that when sailing without a plotter one has to constantly be on the chart. I feel that with the chart plotter it is all too easy to just check that one is following the waterway etc. and not constantly monitor the actual position on the chart. Furthermore, with our small plotter, one does not get a very good overall view from the five-inch screen. My first boat did not have a plotter, so navigation was part of the challenge. Of course one can rehearse those skills with plotter also, but in practice checking the position from the screen is pretty automated for me. It sort of takes the joy out of the navigation, but on the other hand, increases safety...when used correctly! This is an interesting topic and I've been wondering about the usability of iPad too. The only glitch is that I don't have one... And being a luddite and an old school man in all respects, my plotter has only charts from Inkoo to Mariehamn. On the other hand, the plotter is so far away from the helm that it is pretty difficult to see the display anyway. I have to admit that a big screen plotter or a tablet would make things easier when beating on narrow passages. Will have to investigate. I believe that nowadays, many problems related to navigation are due to the lack of "old school" navigation skills. Well I do not have any experience on pre-GPS era. I think that back in those days especially the offshore sailing was quite different. And also the reward, when getting to the right place after a long crossing! Our small plotter is wall-mounted in front of the cockpit. This is the best place in our boat, since the plotter can be operated while steering, but it is also visible to the 'crew'. This is one benefits of a boat with small cockpit and tiller steering! We have echo sounder and a speed log integrated to the display of the chart plotter, so it is basically monitored all the time. We only use our IPAD. We didn't buy any of the garmine or raymarine products. Hi Antti, and the others. 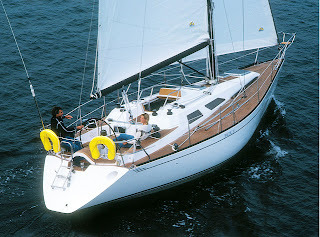 Like Timo, I am of the 'old school' and most of my sailing in the Southern Baltic had been with paper charts and a GPS down at the chart table. My first visit to the area was a bit of an eye opener, but after a few hours of using the (excellent) Finnish and Swedish charts, I became used to navigating the channels and avoiding the rocks. Having watched people using iPads/plotters/phones/etc, I have noticed that it is easy to become fixated on the screen (e.g. playing with the zoom function...) rather than using the good old Mk1 Eyeball! If sailing in the English Channel for example, this is not a particulaly big deal, but in the Skärgård things can happen pretty quickly at 6 or 8 knots in those narrow channels, and I have found it quicker and safer to glance at a paper chart rather than an electronic screen. (I am of course talking about those chart books that come in a waterproof plastic envelope). In poor visibility and/or bad weather then a plotter of some sort is very useful but, as always, I would be checking its reading with every other navaid that was available to me - echo sounder, radar, handheld GPS, etc. and would still be marking our positions on the paper chart in the normal way. Hi Richard, nice to hear from you again! I agree with you totally that with plotter it is easy to become fixated on the screen. I found that this will most likely happen in somewhat familiar waters, where one kind of knows the route. So the paper chart is left untouched and only the plotter screen is monitored. And when the screen of the plotter is usually quite small, some important details outside the screen may be left unnoticed. Therefore, I try to use kind of "system", where paper chart is used for having a big picture of the area and the plotter is used for cross-checking the location when passing dangerous rocks, shallow waters or rounding seamarks etc. However, as I mentioned, it is easy to forget this "system" in familiar waters. I have heard of quite of many boats, which have run aground due to the plotter, because the chart material used is not as accurate as the plotter. It is indeed tempting to narrow the safety margins when sailing with a plotter. Hi Antti - interesting to hear what you have heard about the opinions of non-local Baltic sailors. A couple of things spring to mind - I wonder how many of those sailors have actually been to the Baltic?! (usually the 'fear' is greater than the reality), and maybe this is a rumour put around to keep the local waters free from the huge congestion we see in the UK! My personal view is that the Central & Southern Baltic is one of the best cruising areas, for multiple reasons. Also (again, my personal opinion) I think that navigating in the Baltic is much easier than the North Sea/ English Channel area, and the Southern Baltic (Denmark, Germany) is the easiest of the lot. Tidal streams are a huge factor - probably the major factor, including weather - to take into account when sailing where tides exist. Remember that in the English Channel area, every time you go out on the boat you will face a tidal variation of a few metres in height with streams of 2 or 3 knots which are in a constant state of change, and they cycle every 6 hours! To take the extreme example, over in the Channel Islands, Jersey in particular, we have a tidal range of 11 metres at Springs and tidal streams which are, in places, greater than the hull speed of most yachts. It's not particularly a problem, but one does have to be aware of the issues and use them to your advantage. Well, I say it's not a problem - maybe I should add that if you want to go from A to B at a certain time, and the tides are not favourable, then you can't go! And of course even if you are going down-tide but upwind, the sea state is going to be more challenging than if there was no tide. Yes, plotters and the like are great tools but one does have to be aware of a few things about using them. What is important is that we as sailors keeps our wits about us and develop that 'sixth sense' which could be summarised by the word 'seamanship'. And of course the way to learn is through experience and making a bunch of mistakes - the bigger the mistake the faster I learnt! I am looking forward to reading your log when you venture into the Southern North Sea for the first time. Ok, thanks! It is good to know that this kind of impression is not commonly held outside Baltics. I agree that it might indeed be a rumour rather than something based on a real experience. Personally, I think that archipelago makes sailing a lot easier, because of the shelter it gives from the open sea. No plans of coming to the Southern North Sea yet. But I can believe that tidal streams make life much more complicated, because of the timings etc. You just can't always go out, even if the weather is favourable. We might be coming back to Swedish west coast or Norwegian southern coast in the future, but (fortunately) tidal streams are almost non-existent there. Tides are just another thing to factor into passage planning; it's not very complicated to work out what's going on and sometimes they can be really useful. Often they are a pain in the ****! Antti - I appear to be 'Anonymous'! This is of course Richard in England (the HR Users Group). Seem to be having trouble with Google recognising my profile. Sorry about that! Hello Antti, thanks for your comment about the washing. The comment dissapeared.. can you give me the link again?